Craig Ross from Kirkhill, pictured in action today, shares the lead with three Englishmen on the 66 mark at the end of the first round of the EuroPro Tour event at Harleyford, Buckinghamshire. Ross was the first of four to reach the clubhouse and did so in style, picking up just a single bogey en route to his 66. “I felt I played really well today”: said the Scot, who burst onto the EuroPro Tour scene in 2014, winning at Mar Hall Golf Club as an amateur. Lawrence Allan (Alva) is the second best Scot on 68. The field will be cut to the leading 50 and ties at the end of Thursday's second round. 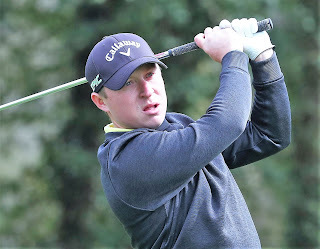 Overnight there are five Scots in the top 50 - Ross 66, Lawrence Allan (Alva) 68, Paul McKechnie (Braid Hills) 70 , Jordan McColl (Kingsbarns Pro Academy) and Portlethen's Sam Kiloh, who plays out of the Paul Lawrie Golf Centre. McColl and Kiloh are both on the 71 mark. 68 B Hall (Spurk Golf), L Allan (Alva), M Collins (Stoke by Nayland), J Dean (Hillsborough), A Lodge (Azego), A Dalgleish (Haywards Heath), W Whiteoak (Shipley), J Freeman (Retford), L O'Neill (Leeds).